I seen your first list and loved it! Great job on going viral! I'll need these two list when I visit Texas. Selena museum and statue is a must! Love me some "Selenas". Love this! There's so much I haven't yet done in my home state! I need to make one! This is a crazy awesome list! I should make one for here in Portland! Whoooo hoo! Now this is a list girl! Sounds like great fun! LOVE this list! I've only been to TX for conferences or to change planes but it's on our list, tons of fun options!!!!! Wow, this looks like an awesome list. You are inspiring me to make one for Chicago...in all my spare time, ha ha. Oh, and your FB page cracks me up when you comment about the crazy happenings in your town. How awesome! I love your lists and look forward to using them on upcoming trips to Texas! We have family in San Antonio so most of our time is focused there. Thanks for sharing this list for the rest of Texas! Stopping by from Southern Girl Blogging Group and hope you linkup your post with our Small Victories Sunday linkup open all week long. Thanks for linking up with us at Small Victories Sunday linkup. I hope you found some great posts to visit. Pinned to our linkup board. I've never been to Texas but have the same problem here in New York--New York is also a very big state with more then you can possibly see or do in a lifetime! There's so much fun stuff to do in Texas! I've done several things on this list but there are many more left to do. Now that is a huge list! Never been to Texas but it does look interesting there! I think I've been to some of these places...thanks for sharing this list! That's a long list of places to visit in texas. I hope to visit the place too. There is so much to do in Texas! I am a huge fan. I spent most of my life in OK and had a lot of friends in the TX area so I spent a lot of time traveling through the state. I would love to visit Texas. They say the houses are huge and for a great price too... if my fam. wouldn't be so far away, I might even consider moving there! Saw your post on Facebook and love everything about it! I think it's so cool that you were able to come up with 200 things you want to do. This is quite the list of things to do in Texas. I've never had the pleasure of visiting the state, but I have a good idea of stuff to do there if I get to now. What a great list! I haven't been to Texas in quite a few years, but I love visiting Dallas and San Antonio! a rodeo for sure!!! lol. i lived in el paso for a little while and always wanted to travel to other parts of texas; mainly austin and dallas. but if you want the best mexican food of your life head to el paso...and you can check out that museum too! Love your travel bucket list!! Sometimes the greatest adventures is in your backyard or state!! Making one for my home state of Virginia! What a great list! :) I love reading other people's bucket list! :) So fun because everyone's is different, unique and diverse! Woot Woot on going viral! 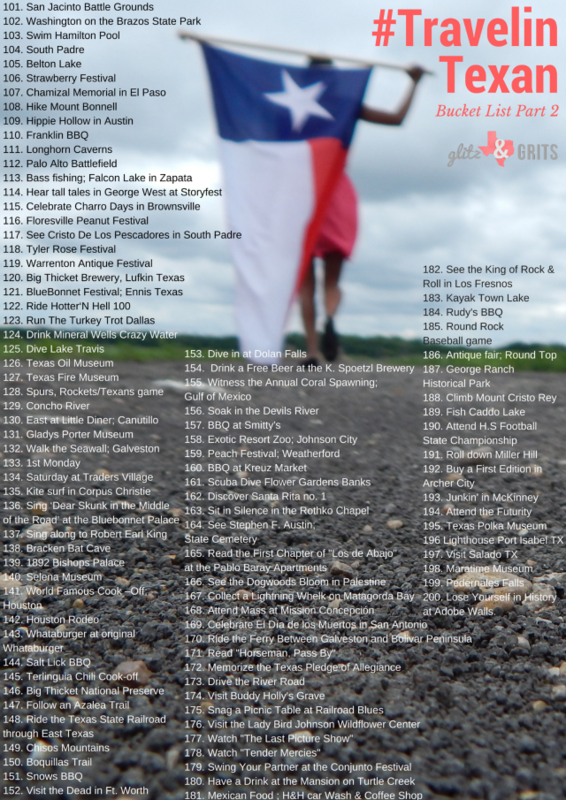 It's a great list and next time I'm in Texas, I'll make sure to catch a few of your bucket list recommendations. That is quite of an impressive list. Thank you for sharing! I definitely wouldn't mind visiting Texas again someday. Wow that is a lot of stuff to do in Texas. I've never been to Texas before. Awesome on going VIRAL! That is a ton of stuff to do in Texas, I have only been there on business. This is so awesome!! I need to add a lot of these things to my list! Promise me that when you go to San Jacinto you call me, I will totally be your tour guide! It's also really close to one of the best bird watching spots in the world! This is a bucket list I can get behind. Wondeful bucket i will also some places in my bucket list. thanks for giving me these all places ideas. you can aslo visit indian city historical monuments book now Golden triangle tour 5 days and enjoy this journey. I really like your article it looks like very Nice, Attractive. Thanks for sharing this content with us. If anybody wants see the beauty of Agra city in a single day for them Same Day Agra Tour By Car is the best tour package to spend some good time with your love and family. thanks for sharing this bucket list.